Herbal Remedies: TEMPE, nutritious food unhealthy? Anyone know if tempeh is a soy foods as nutritious as raw materials contain many important nutrients for the body's metabolism. Soy is a popular food in Indonesia because many traditional food products made from soy, such as tempeh, tofu, and soy sauce. Soybeans are a source of protein, molybdenum, iron, calcium, phosphorus, fiber, vitamin B1, B2, B6, E and folic acid. Soybeans also contain active compounds which are very good for health, such as phytosterols, lecithin, isoflavones, phytoestrogens and protease inhibitors. These compounds are very good for our health, among others, enhance immune function, prevent cancer, lower cholesterol, improve heart function and bladder, a variety of neurological disorders, Alzheimer disease, Parkinson's disease, reduce symptoms of PMS (premenstrual syndrome) and osteoporosis . Specific isoflavone compounds are very good for preventing breast cancer and colon.However, little is know that nutritious foods like tempeh are not automatically healthy. This is particularly true when we refer to the concept of "Real Food" (healthy food) that is growing in developed countries like the U.S., Japan, Australia and European countries. Real food is food that meets the following criteria: 1). Contains nutrients essential for the metabolism of the body, 2). Does not contain hazardous components, toxic, or not useful to the body, 3). Organically produced, 4). Produced locally, 5). Produced in a sustainable (sustainable), 6). Affordable for most people (affordable), 7). Easily available (accessible), 8). Undergo a process of processing a minimum, 9). Environmentally friendly, and 10). In favor of the local farmers. Tempe, including real food when soy is used as raw materials are organically grown soybeans. If the raw materials derived from GM soya (genetically modified) or soybeans grown with chemical fertilizers and chemical pesticides, tempeh is no longer able to be categorized into real food. Why? Although transgenic soybeans have a nutritional value equal or even higher than organic soybeans, there are security issues. It may be that in the long run these foods actually have adverse health effects. Soybeans grown with chemical fertilizers and pesticides also contain residues of pesticides that are harmful to human health and degrade the quality of the environment. In addition, transgenic soybean is economically more profitable multi-national companies, not the benefit of farmers. The farmers even harmed because it must rely on the supply of soybean seeds in large companies. When the organic soybean imports as well but still not including real food because it does not favor or side with the local farmers in accordance with the concept of real food. Of the 10 characteristics on the Real Food, tempeh in Indonesia currently only meets 4poin course, is no. 1, 6, 7, 8 so that the concept of Real Food tempe still can not be regarded as healthy foods. Even some time ago tempe was scarce and the price went up so affordable and accessible criteria also had not met.Well, to maintain the designation of Indonesia as a "nation tempe", it is still a lot of homework to be done well, involving the entire nation, not just governments, but also required the participation of business people, researchers and consumers. Currently the government is trying hard to maintain cheap and easily available criteria by providing tax relief for short-term imports of soybeans and soybean efforts to increase the land area in the country and to increase local soybean productivity for medium and long term. The researchers also have much to offer solutions, primarily related to the use of soybean varieties with high productivity and the substitution of soybean as a raw material with other materials such as black beans, lentils and lupins. Live business people and consumers are still required to meet the other criteria. In terms of processing, the food business and tempe home mothers are required to process them correctly. Tempe is best disayur or fried, not baked. Use the new oil, not cooking. Fried tempeh is sold on the street most unhealthy because it uses recycled oil. For the recycling of oil contained trans fatty acids heating carcinogenic (cause cancer). Application of organic farming to be a necessary condition for real food. In many studies have shown that organic food is more healthful than non-organic materials. Food should also be widely accessible, otherwise there will be some people who can not enjoy the chance to be healthy from the food. It should also be cheap. If the tempe expensive so it is not affordable, most people will lose the opportunity to get a nutritious food and healthy. In other cases, if the raw materials imported soybean suddenly stopped (embargo) by the manufacturer in the LN, we will experience food security problems. Tempeh is edges are on the market and those who rely heavily on soybean as a source of nutritious food will be trouble and eventually get sick because they can not eat tempeh again. 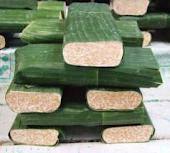 By applying the concept of real food, tempeh which is believed to be more healthful healthy again. Not only healthy for human consumption, but healthy for the environment and healthy for the economy of local business community (soybean farmers, craftsmen tempeh) and the state. So, we are lucky, lucky people.Of course the concept of real food does not just apply to Tempe, but for the entire food groups such as rice, vegetables, fruit, meat, fish, eggs, milk and other dairy products. For food derived from animals like meat, real food requires another, the animal should be bred with peri-zoological principles. Has been scientifically proven that meat derived from cattle that "happy" (grazing on grass area) is much more healthful than beef from cattle that the stress of caged in a small room and are fed grain (meat of this kind raises a lot of health problems such as high cholesterol, stroke, heart disease and cancer). Real food instead of meat is very good for these diseases.